The Ultimate POP3 is a part of the Mail Component which offers a comprehensive interface for receiving e-mail messages from a server and managing them remotely, all from within your application. The Ultimate Pop3 is a part of the Mail Component which offers a comprehensive interface for receiving e-mail messages from a server and managing them remotely, all from within your application. In addition, it also allows you to compose, decrypt, encrypt, sign, and validate email messages. SMTP / POP3 email component COBOL library to send and receive mail including HTML and MIME base64 and quoted-printable encoded attachments from a program. Supports SMTP (ESMTP) and POP3 authentication. Supports Fujitsu and MicroFocus COBOL. SMTP / POP3 email component dBASE library to send and receive mail, including HTML and MIME attachments, from within an application. Supports SMTP (ESMTP) and POP3 authentication and ISO-8859 and UTF-8 character coding. Supports all dBASE versions. SMTP/POP3/IMAP PowerBASIC email component library uses a simple API to send and receive mail, including HTML and MIME Base64 and quoted-printable encoded attachments. Supports SMTP & POP3 authentication, SSL/TLS, ISO-8859 and UTF-8 messages. SMTP/POP3/IMAP Visual FoxPro email component uses a simple API to send and receive mail, including HTML and MIME Base64 and quoted-printable encoded attachments. Supports SMTP & POP3 authentication, SSL/TLS, ISO-8859 and UTF-8 messages. SMTP/POP3/IMAP dBASE email component uses a simple interface to send and receive mail, including HTML and MIME Base64 and quoted-printable encoded attachments. Supports SMTP & POP3 authentication, SSL/TLS, ISO-8859 and UTF-8 messages. Royalty free. SMTP/POP3/IMAP Xbase++ email component uses a simple interface to send, receive and parse mail, including HTML and MIME Base64 and quoted-printable encoded attachments. Supports SMTP & POP3 authentication, SSL/TLS, ISO-8859 and UTF-8 messages. SMTP/POP3/IMAP C/C++ email (32 & 64 bit) component library uses a simple API to send and receive mail, including HTML and MIME Base64 and quoted-printable encoded attachments. Supports SMTP & POP3 authentication, SSL/TLS, ISO-8859 and UTF-8 messages. Email component for .NET, SMTP over SSL, IMAP over SSL, POP3 over SSL and S/MIME. Allows sending, receiving and processing emails in .NET framework. Supports S/MIME for sending signed emails, signed emails validation, encryption and decryption. 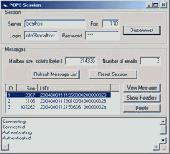 A POP3 / SMTP email . 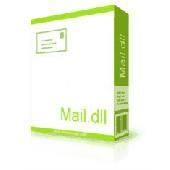 MailLib is a free component for sending and receiving e-mails using SMTP/POP3. COM library for Visual Basic 6, providing functionality to retrieve emails from mailserver (POP3). .
MailBee.NET POP3 enables .NET applications to receive, parse and manage mail on POP3 servers. PIPELINING (dramatic performance boost), TLS/SSL, proxy, S/MIME, accurate MIME parser, HTML mails, international charsets, embedded pictures, and more.